So first let me show you a page from my Newfoundland travel journal that I have been working on. 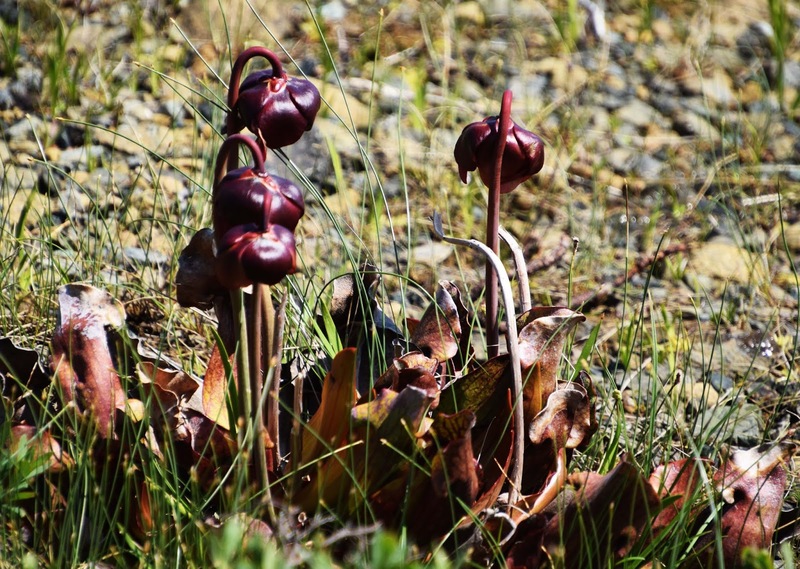 It's a mixed media painting of the carnivorous pitcher plant that is also the provincial flower of Newfoundland. They were flowering when we were there as you can see these droopy looking flowers. The leaves are these short tube shaped structures. They fill with sweet fluid/nectar and which attracts insects, and when the insects go in to feed on the nectar they get stuck. Then the plant releases digestive enzymes that changes the insects into food for the plant. These plants grow really well in stark rocky environments because they don't need to rely on rich soil to grow since these insects give them their nutrients. We saw a lot of these in a part of Gros Morne National Park called the Tablelands. 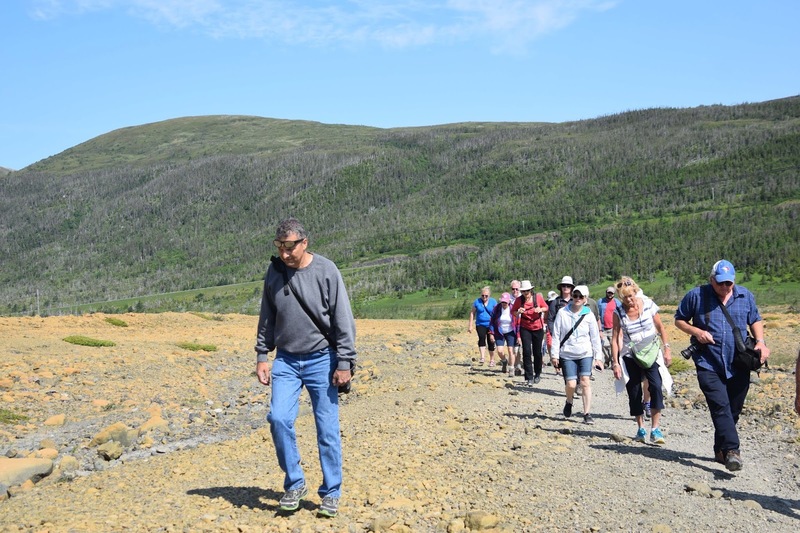 We went on a ranger lead hike up into the Tablelands. You can see how the mountain the background has a lot of green trees, but where we are walking is rather rusty brown. 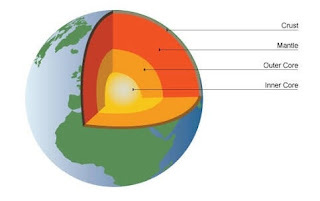 The reason this area is rusty brown is because there is high amount of iron and other metals in this rock. And this is very special rock. It comes from a deeper layer of the earth called the mantle.This rock is not like rocks we find on the surface of the Earth. 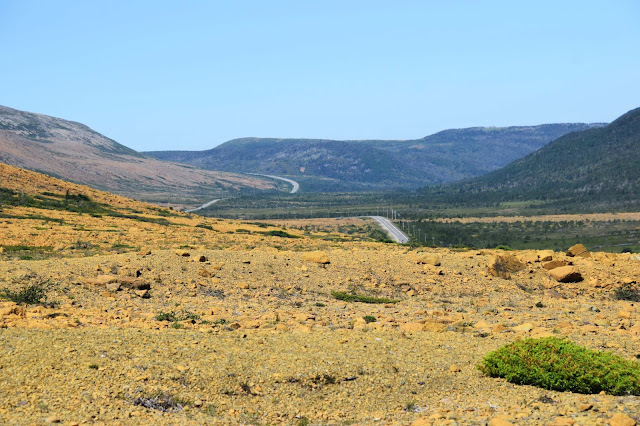 In fact the Tablelands is the largest area of mantle rock you can find on dry land on the entire planet Earth. This is picture (the one above) is also deceiving. Although the mountain behind the ranger doesn't look that tall it is 2300 feet high. 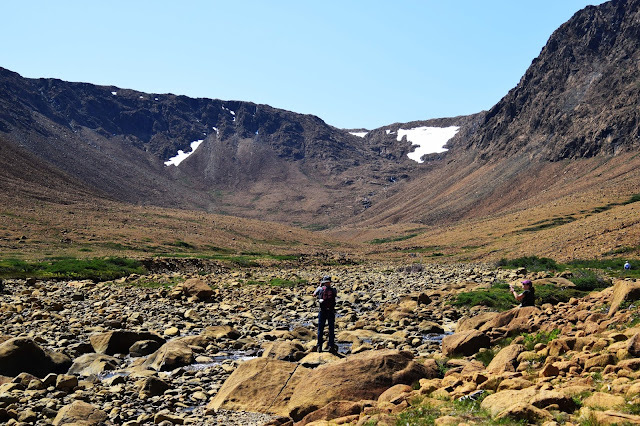 I know that isn't really tall compared to many mountains, but the Appalachian Mountains that run from the southeast US all the way up the North American East Coast into Newfoundland, Canada are one of the planets oldest ranges and have been exposed to lots of glaciation which wore them down. This is the same mountain range that runs through New Hampshire where I live. And yes there were still little patches of snow. It was very different from the rest of the park. Hope you enjoyed your visit today. You drew the pitcher plant SO well. I think it is a marvelous painting. MOST IMPRESSIVE, Erika. 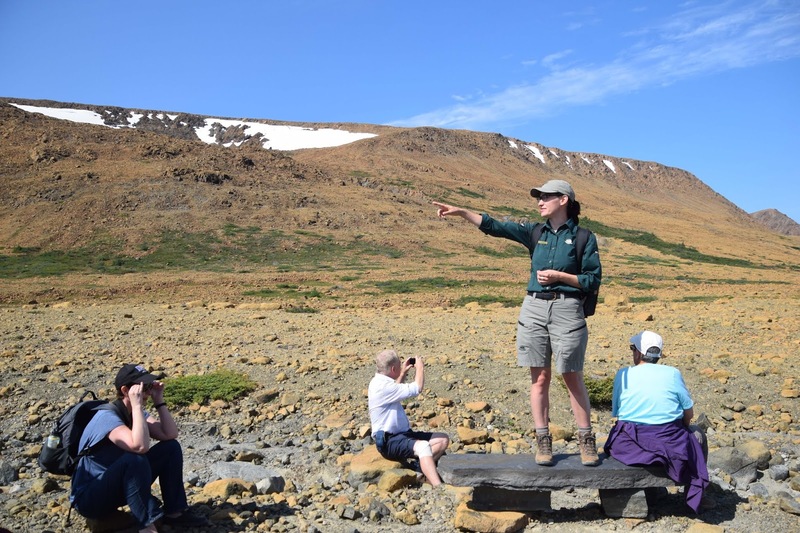 The Tablelands are so different from the lush green and watery areas we saw yesterday. It's hard to imagine it's in the same park. This was truly fascinating, a joy to see, and a wonderful geography lesson. Looks like everyone was there to take photos, too. Speaking of photos, yours were superb and gave me a general feel of this part of the park. Thanks for taking us with you on this incredible journey. Your Mixed Media painting is gorgeous and you even cut the bloom on top...so special and I really loved your whole posting - those plants are fascinating...wow.. and what a special area this is! Thank you for sharing Erika! What a fabulous landscape, and I love your painting Erika! Your mixed media flowers are so beautiful - beautifully painted - love the colours. Have a wonderful week and I hope its not too humid or wet. I certainly did enjoy my visit today! Not only is your journal page amazing, those flowers look incredible IRL and how interesting how they feed themselves, - nature is just amazing! 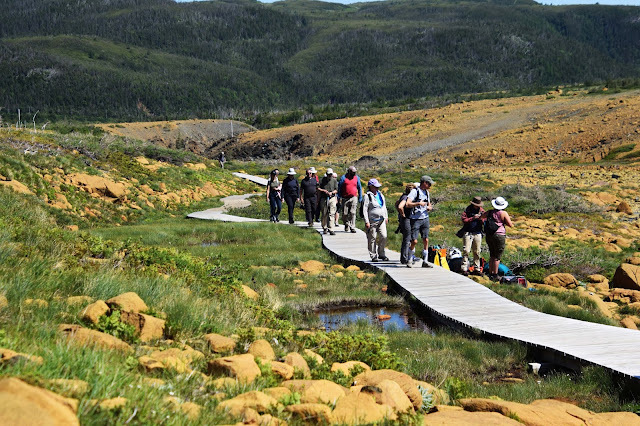 The National Park looks incredible too! The pitcher plant looks so innocuous. And the landscape where you were could pass for the moon with the barren rocks. Looks like more rain this week.Stay dry. 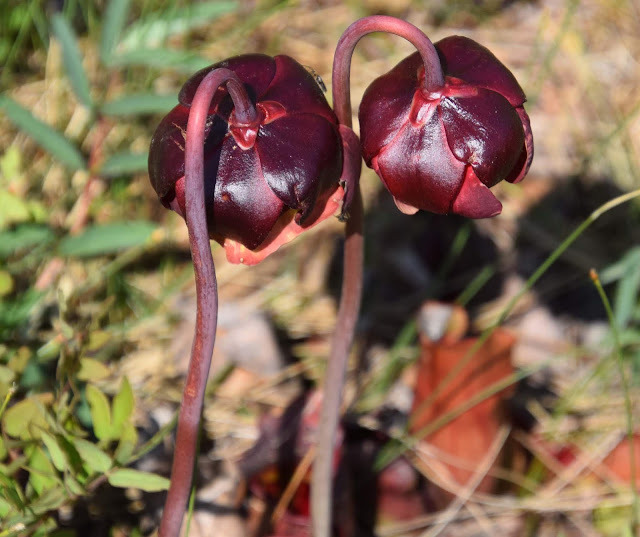 Your pitcher plant painting is amazing for its likeness to the plant itself. I didn't know about this region and appreciate the tour. Thx! Wow its an amazing painting of the pitcher plant. The photos were super as well, we only read about or see these plants in specialist garden centers, so it must have been super to see them for real. The landscape scenery looks awesome as well. What an interesting area! I would like to visit there and see it for myself. Those are places I really enjoy to experience. Your painting is beautiful - you brought out this special plant perfectly. Your painting of the flowers is perfect. Beautifully done. Bravo to you (can you hear the wee-est bit of envy in my words?!) I love it. I truly enjoy seeing all your travel photos. A fascinating trip you had. I can see why Rick so wants to go there.